Oliva, L.; Alvarez-Napagao, Sergio; Vazquez-Salceda, J. Systemic analysis of dynamics in complex networks has allured interest from different fields. Norms are a mechanism that can be useful to govern or guide the behavior of agents in such scenarios. Such effects of norms can be analyzed in different terms, such as emergence, spread, equilibrium oscillations and stability. In this paper, we present an analysis of the life-cycle of deontic norms in scale-free networks, with special focus on the long-term effects of different agents’ personalities and their structural properties. Our approach combines provenance-aware monitoring traces and the analysis of the dynamics emerged in the relations between agents by means of complex network representations. Oliva, L.; Alvarez-Napagao, Sergio; Vazquez, J. 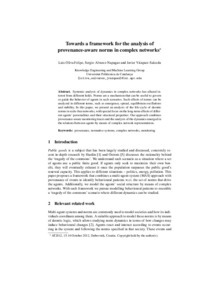 Towards a framework for the analysis of regulative norm performance in complex networks. A: Agreement Technologies. "Proceedings of the First International Conference on Agreement Technologies (AT 2012)". Dubrovnik: 2012, p. 103-104.